In this sci-fi dark-comedy-drama, Anne Hathaway learns that the bigger they come, the harder they fall. She plays Gloria, an alcoholic out-of-work writer whose irresponsibility has led to her boyfriend Tim (Stevens) breaking up with her. After getting kicked out of their house by Tim, Gloria moves back to Maidenhead, the small Midwestern town where she grew up. Her childhood friend Oscar (Sudeikis) helps Gloria get back on her feet, offering her a job at his bar. Gloria becomes acquainted with Oscar’s friends Joel (Stowell) and Garth (Nelson), developing a romantic interest in Joel. When a giant bipedal reptilian monster appears out of nowhere to terrorise Seoul, Gloria comes to the startling revelation that she is controlling the creature. At a specific time every day, the monster materialises in South Korea, and mirrors Gloria’s physical actions. As Gloria processes this surreal turn of events, her personal relationships take similarly unexpected turns. There is a film franchise centred on giant robots, which releases its fifth instalment this year and has the tagline “more than meets the eye”. While there’s often less than meets the eye with that film series, there’s far more to Colossal than one might think. Colossal comes from writer-director Nacho Vigalondo, who helmed the mind-bending Spanish-language film Timecrimes and the experimental techno-thriller Open Windows. Colossal’s zany premise of a kaiju that just happens to be controlled by a random American woman is only its first layer of weirdness. By the film’s end, it’s evident that this is not a movie that is weird solely for the sake of being weird. The film’s genre-defying nature plus its blend of comedy and genuinely unsettling drama might alienate some viewers, but it adds up to a uniquely compelling whole. 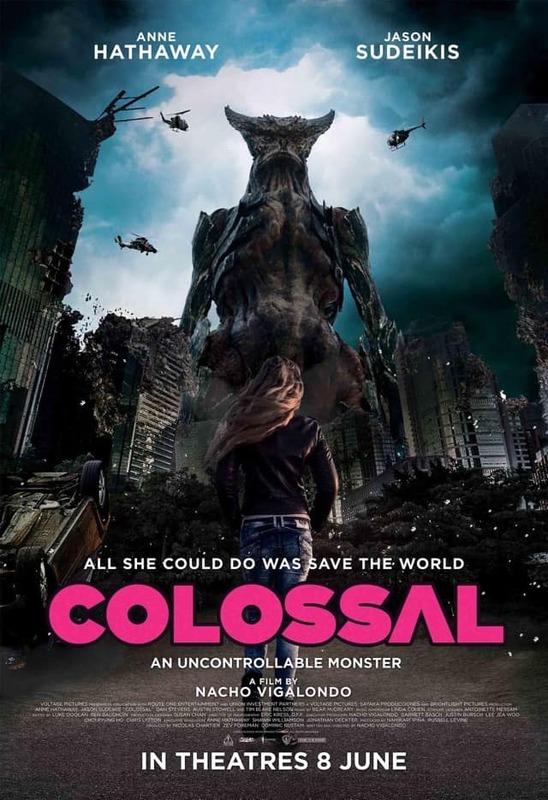 Colossal has been marketed as a quirky comedy; its trailer scored with light-hearted music and its cutesy poster depicting Hathaway scratching her head, with the monster standing behind her, doing the same. While the inherent absurdity of the premise does lead to some laughs, Colossal winds up in an unexpectedly dark, dramatic place. As characters’ back-stories and motivations come to light, things suddenly feel a lot more serious than they did earlier in the film. Rather than feeling like whiplash, this trajectory is earned. The story is gripping enough for this reviewer to go along with – even given an explanation for the film’s central phenomenon which requires more suspension of disbelief than usual. The film’s budget is estimated at around US$15 million, which is a paltry sum compared to summer blockbusters than can cost upwards of US$150 million. Vigalondo smartly allocates his resources and the visual effects spectacle holds up sufficiently well. The climactic sequence, which includes scenes of the South Korean army ushering panicked civillians to safety, is more riveting than this reviewer thought it would be. Hathaway is goofy and endearing but is also able to evince the hidden conflict within Gloria. The attractive woman whose life has spun out of control thanks to a drinking habit could well be the lead character of an insufferable sitcom but like with other aspects of the film, Colossal takes that archetype and builds it out in a surprising way. It’s difficult to meaningfully discuss Colossal without giving too much away, so skip past this paragraph if you’re worried about spoilers – we’ll try to be vague. This is likely the most depth Sudeikis has been able to display in his acting career. He plays Oscar, who starts out as your standard ‘nice guy’ character, but the cracks begin to form. As defined in various think-pieces, the ‘nice guy’ is a man who gives the appearance of being thoughtful and caring while pursuing women and who becomes bitter and resentful when his advances are rebuffed. The deconstruction of this trope as performed by Sudeikis is visceral, sorrowful and engenders just the right strain of uneasiness. Stevens’ supporting role is a minor one, but he does get to retain his English accent. The friction that arises from the initial friendliness shared by Gloria, Oscar, Joel and Garth in the bar unfolds in believable fashion. 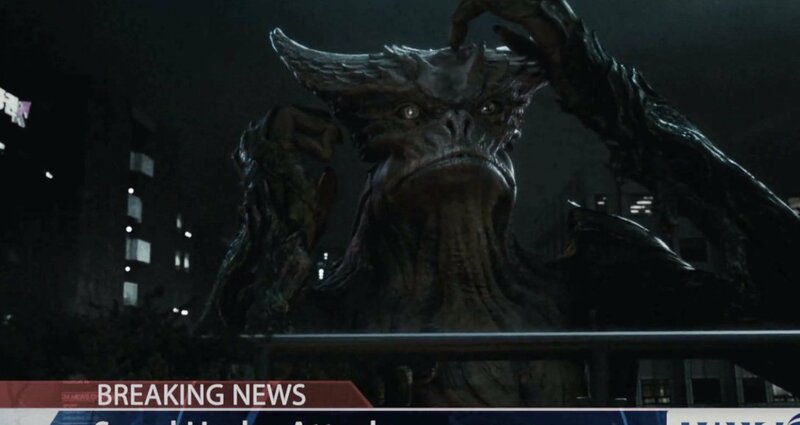 It is perhaps ironic that Colossal’s producers were sued by Toho Studios, who claimed the film was too similar to their flagship kaiju Godzilla. There are superficial similarities in that Colossal, like Godzilla, features a monster stomping about an Asian metropolis. However, the underlying allegory is completely different, and Vigalondo’s boldness in crafting a film that defies classification pays off, in that it is far from a jumbled mess. Colossal not only breaks the mould, it stomps on it with insouciant defiance. Summary: Colossal is an odd beast, but the weirdness that fuels it belies surprising depth, salient social commentary and emotional resonance.